Even at just 15 inches tall, this biker dude garden ornament is one tough guy! 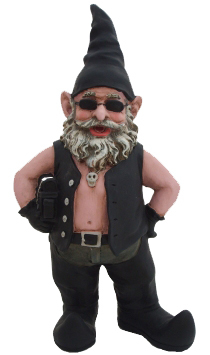 Made from cast stone resin and resistant to all kinds of weather our biker gnome is as rugged as he looks. He's got his leather vest, chaps, boots, gloves and shades on, and he's ready to ride off into the sunset. If one isn't enough, you can order our biker gnome couple. See our 15-inch Biker Babe Gnome on her own page. Both our biker and his biker babe have lots of attitude.